LAMB prices hit a six-month low with the Eastern States Trade Lamb Indicator averaging 647c/kg cwt this week, Meat & Livestock Australia said. Processors are quoting 3-4 week waits for producers trying to book in direct consignments, while the price decline has also led to some lamb sellers withholding lambs from saleyards as processors were less active. At the Wagga saleyards on Thursday, agents yarded 23,000 lambs, 7000 fewer than the week before, with the National Livestock Reporting Service saying producers held back lambs following cheaper trends at other selling centres. Only a small field of buyers attended and six processors did not operate. The NLRS said competition was notably weaker, with buyers very selective when bidding. 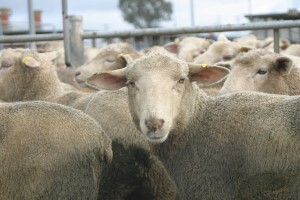 Restockers were also cautious, but feedlot buyers bought most trade weight lambs. The bulk of the shorn trade lambs sold $12-$14 cheaper to average 612c/kg cwt. New season trade lambs made $119-$140 and store lines sold from $71-$122. Shorn lambs 20-24kg cwt and suitable to feed on sold $10 cheaper at $122-$158. The NLRS said competition for extra heavy lambs was weak, with only a few buyers operating. The heavy lambs generally sold $13 cheaper, averaging 609c/kg. The outstanding quality extra heavy lambs lost $21 to average 584c/kg. MLA said on Tuesday, 5 February, the Eastern States Trade Lamb Indicator averaged 647c/kg cwt, down 4pc week-on-week. The indicator has not averaged below 650c/kg cwt since June 2018. Restocker lambs continued to trade at a discount, averaging 619c/kg cwt. The Eastern States Mutton Indicator also eased this week to average 388c/kg cwt, down 2pc on the previous week. MLA said in the week interrupted by the Australia Day long weekend, eastern states weekly lamb slaughter fell 18 percent to 313,000 head. While this total was comparable to the same week in 2018, weekly yardings tell a different story. For the week ending 2 February, eastern states lamb yardings totalled 123,000 head, representing a fall of 16pc week-on-week and a fall of 20pc year-on-year. MLA said although monsoonal rains have arrived in parts of northern Australia, dry conditions in the southern states remain a challenge. Across NSW saleyards, lamb yardings totalled 68,000 head, down 20pc on the previous week and down 28pc year-on-year. In Victoria, yardings totalled 42,000 head, falling 19pc week-on-week and 9pc year-on-year. For producers selling direct-to-works, weekly over-the-hooks indicators collected by the National Livestock Reporting Service demonstrate the continuation of a falling trend, MLA said. Nationally, lambs in the 20–22kg carcase weight category fell 1pc this week to 676c/kg cwt. Heavier lambs (22–24kg cwt) were steady at 681c/kg cwt. State-based indicators for heavy trade lambs remained below 700c/kg cwt across all states for the second consecutive week, MLA said. In recent months, eastern states indicators have begun to converge with prices in the west. In October 2018, NSW heavy lambs were achieving a 28pc premium over their Western Australian counterparts. This premium fell to 5pc for the week ending 4 February, MLA said.